Antlitz: "Our ambition is to reach our 2025 target earlier." FRANKFURT -- Volkswagen Group's core VW brand could exceed its 2017 profit margin target, the automaker's finance chief, Arno Antlitz, said. The brand, VW Group's largest division by sales, expects its operating margin to come in at the upper end of its 2.5 percent to 3.5 percent target after 1.8 percent last year, Antlitz said. However, "if markets, especially in regions such as Russia or Brazil continue to stabilize, we do not rule out the chance that we might even slightly overachieve the 3.5 percent," Antlitz told a conference call on VW brand's first-half results on Friday. The brand's first-half margin was 4.5 percent. Potential headwinds could be increasingly strict worldwide CO2 and emission legislation as well as VW's goal to become a leading mobility provider. "We will evaluate the sustainability of our progress in our next planning round in November," Antlitz said. Part of the reason why the brand's targets may need to be adjusted is a decision to reclassify billions of euros in revenue initially booked at the brand but now moved to VW Group to create better transparency. Unrelated revenue generated by the sale of vehicles from other group brands had heavily diluted returns and has been retroactively stripped out of the VW brand's top-line as of this year. This meant revenue fell by 13.1 billion euros to 39.9 billion euros on an unadjusted level in the first half. Adjusted for the change, revenue rose 8 percent, VW said. Operating profit doubled to 1.78 billion in the first half, mainly driven by positive mix and pricing effects, helping the brand to reach a 4.5 percent margin. The brand's restructuring is making headway, helped by strong demand for new models in the United States, Latin America and Russia, VW said on Friday. VW brand's vehicle deliveries grew by just 0.3 percent to 2.9 million in the first half. Vehicle sales increased by just 0.2 percent in China and Europe and were down 5.5 percent in Germany. The brand expects revenue to rise by 10 percent for the full year. 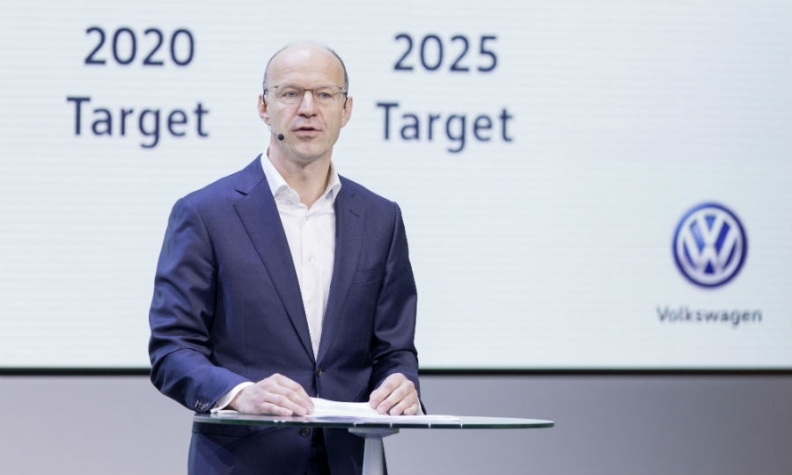 VW brand still targets a minimum 4 percent margin in 2020 and 6 percent in 2025, goals that were presented last November during a strategy review. "Our ambition is to reach our 2025 target earlier," Antlitz said.